This topic continues from Armors of Cyrodiil. Please check there for more concept art and proposals. The focus of this thread is on practical implementation and usage. Popular light armor choice throughout Colovia, sort of the same level as Nordic Fur in the base game. Exists in several color variations (Yellow, Red, Black, White). Several basic parts like helmets, gauntlets, and boots are already included in data. There are also some unusual extravagant fur helms. Design for the cuirass is still unsettled. The base game's Imperial Studded Leather will serve as an Imperial leather type. Mostly used in Colovia and the northern Cyro-Nordic areas, as well as by the Legion. Studded leather will have two regional variations: Brena and Kreath Studded Leather. They are distinguished by the additions of details like belts, cloth wraps, pockets, dagger holster, etc. (Check PGE concept art for inspiration). The set currently in data is old and visually uninteresting. It should be overhauled to show more color variation, and helmet designs should follow the original Morrowind concept art. Newtscale takes the same place as Studded Leather for Colovia, but in the Nibenay. Refer to Morrowind concept art for helmets and other details. Besides the basic Legion uniform version, two/three regional variants should be made for the northern and southern Nibenay (to be determined). A rare and expensive Nibenese light armor set, on the same level as glass armor. Made from strands of ancestor silk interwoven with silver. The secret to its production is lost. Mothril is a riff on the Oblivion mithril armor, with a Nibenese twist. An alternate variant, Mothweave, can be included as a scripted summonable armor set similar to Bound Armor. Ancient Ayleid armor. See the Ayleid assets thread. This armor set is finished, but still requires some artefact variants, and a crown for Ayleid kings. Based on the vanilla Imperial Chain Armor, mostly used by the Legion. Like the other sets, a number of regional variations can be made based on original Morrowind concept art. Proposed variants are Strident, Massiquerra, and Brumath Chain Armor. 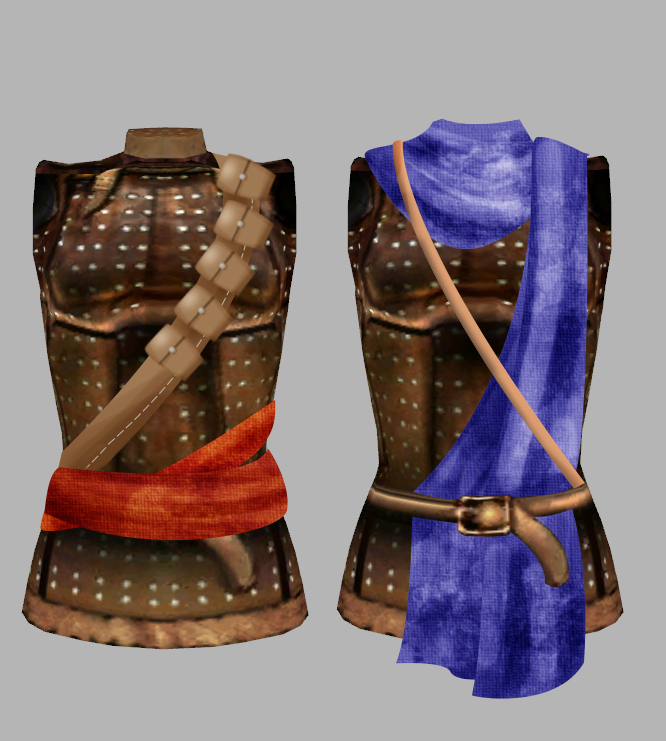 The common armor types used by guards in Colovian cities, but can also be found elsewhere, or worn by players. Three regional variations: Cataphract, Klibanion, and Kalantar, associated with the coast, weald, and northern highlands respectively. This set is mostly finished, but the meshes could use some more detailing. An expensive high-level armor set for Colovian nobility. Currently in data, but the meshes and textures need lots of work. Reworking should keep the concept art from the PGE 1 in mind: cape over the shoulder, armored skirt, etc. Consider using gold, purple and red silks, etc. An expensive high-quality armor set for Nibenese nobility. Possibly also the set used by Imperial Mananauts (see Mananaut helmet in data). Should be influenced by akaviri designs. Expensive and rare Legion set. Armor for top-ranking Legion officials or the Palace Guard in the Imperial City could be based on Dragonscale (mirroring the way the Duke's Guard armor relates to normal silver armor). The set in data currently is not quite in the same style as the original cuirass, could use an upgrade. Most regions have their own unique style. Variation in cuirass could be done through different colors or pattern of rough, dirty-looking silk (wrapped around the armor as if holding it together). Iron armor is cheap and low-class, so variations should reflect this. Planned variants are Murena (gladiator coastal style, see concept art), Mhorla, and Sarchali. Another Colovian classic, which also has a number of regional variations: Oloman, Larich, and Kvatchi. Same rules apply as for iron, though this armor can look more expensive and better kept. Silk elements could also look more floral and bright. 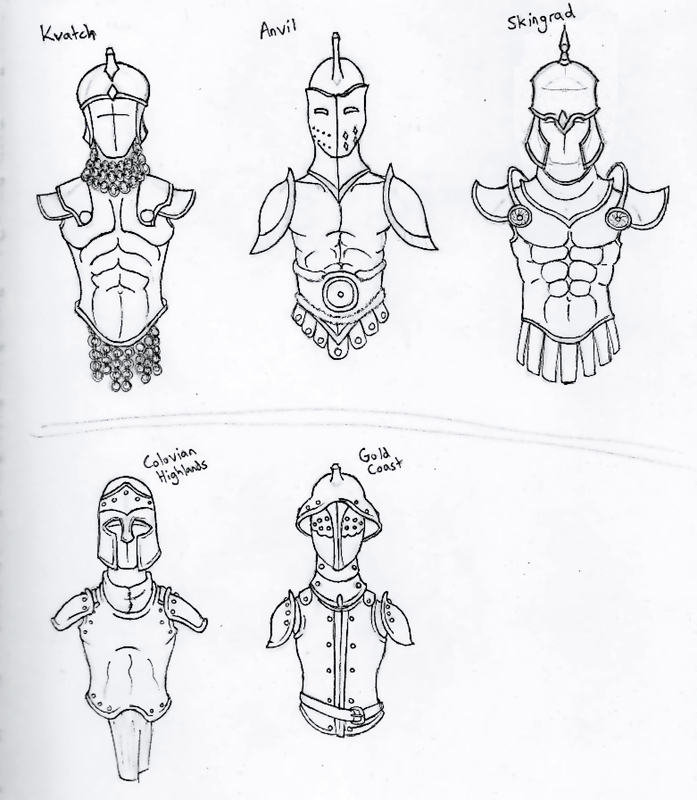 Variations can show in in helmet shape (based on vanilla concept art) and more elaborate cuirass styles, using medals and rank insignia (based on Colovian militarist mindset). A common Colovian armor set based on the design of the vanilla Imperial Steel set, using special textures and dark silk cloth to obscure insignias. Used by Colovian militia men, bandits, etc. The purpose of this set is to echo the design philosophy of the Legion armor set in Colovia. Expensive armor popular throughout Cyrodiil. Besides to Legion version, there also exists the Duke Guard version in the vanilla game (which can be repurposed for other dukes). Further noble/temple guard variations would be interesting, but not a priority. A common Nibenese armor style, comparable to Bonemold in its popularity and ubiquity. Instead of regional variants, different Bronze armor styles are used to denote Totem-Society support. Like most Nibense things, they are lavishly decorated with bright, clashing colors. Daedric worship is prevalent in Cyrodiil, so it makes sense to (rarely) feature items in this material in certain locations. However, the specific style of vanilla Daedric armor is likely Dunmerish, especially the helmet designs. We should consider making an "Imperial" version of Daedric armor, with slight edits to the current set like decorative silken sashes in un-ancestor cloth. A unique series of three or four Daedric Helmets in Imperial themes (Daedric Face of the Emperor) would be very nice. Old Nedic-stiled bronze/leather armor, found in Colovian tombs and places like Sancre Tor. Outdated Legion armor found in old Imperial ruins, once used by the Legions of Reman. Can be various sets. Imperial Studded Leather, Imperial Dragonscale, Imperial Newtscale and Imperial Silver don't seem to be explicitly connected to the Legion, "Imperial" in the name only denoting the place of origin in these cases. As such, these can be used as is, without the need for non-legion versions. I know that, but the use of "Imperial" in those names annoys me. It takes away a large part of the character limit, an it doesn't really make sense (like calling each bonemold cuirass "Morrowind Gah-Julan Bonemold Cuirass" or something like that) so I want to take this opportunity to remove that part. Also, a lot of mods out there add the legion uniform script to those armors. Also, a couple of them are just visually drab and uninteresting: studded leather and newtscale in particular. If we want to make the rest of these armor sets interesting, we should introduce some visual variety in the designs of the originals. And since we don't want to touch original vanilla content, that means making new versions. Quick lore proposal: Meridian Daedric armor - accomplished by binding an Auroran's soul into the raw ebony. This gives it an iridescent sheen as the trapped spirit vents its fury as wavelengths of light. Seen in-game as exceedingly rare/high-level Ayleid loot. I don't know, the iridescence sounds a lot like what Moth/Mithril and Mothweave could look like. We also already have a lot of high-end armors, compared to the lower end of the spectrum (which should get a lot more use). Do you agree with the way iron/steel would be handled, Saint_Jiub? If so, I can scrub the Colovian armors from the Stirk file and replace them with normal iron/steel/chainmail. In fact, I can easily make the regional varieties in data right now, so we only have to drop in the new meshes later. But I don't want to make such a big change without everyone agreeing on it. The bottom row are the two iron sets for Colovia, while the top row is the three steel sets I had proposed (however many of these make it in-game is of course up for debate lol). But yeah, the iron/steel that are currently in data should go, especially since I'm repurposing those helmets/skirts for the Colovian guard armors. I flipped the gladiator look to steel because it was listed under steel helmets in the other concept art. We can make it iron, though, especially since we already have the other Anvil steel style. I would personally prefer to veto the Weald style studded leather, it's going to be too similar visually to the klibanion armor (Skingrad guard). Is there a reason that you're cutting most of the new concepts I had drawn up, though? The Skingrad steel concept is, I think, too flashy for Sancre Tor so that'd have to be redone, you only have one iron variant in this proposal, and we're scrapping the Colovian leather concept altogether it sounds like. I'm not cutting anything: any armor variation not in my previous post is one I can't think of a name for. Kvatchi and Oloman style steel are names plucked from the concept art (same for the Stident chain and Kreath Studded Leather). I'm asking if people can contribute designations for the other sets, not saying we should remove them. Sorry if that wasn't clear. I wrote about the Colovian leather set in the OP: since we already have Colovian Fur and Studded Leather, it makes little sense to make a third Colovian leather set. Can we make these asset-list threads sticky so they are always well-visible and don't get buried below misc discussions? Formulating the extent of our content this way seems like a useful approach. Although I have mixed feeling about the requested amount of variety. It seems like a lot of work to me. Stickied 'em. I know it seems like a lot of variety (I am a bit unsure of it too), but the main thing is that most of these armor sets are already in the game. These variations amount to little more than a slightly edited cuirass or a new helmet model. I would like to pare it down, but I am unsure which sets should be dropped, then. Brena and Kreath style studded cuirass paintovers. The Brena cuirass has a stiletto dagger tucked in the back of that sash, btw. I like it. Stuff like this will really help to emphasize the importance of silk in Imperial culture. That does look very nice, and I like the color palette much more than the current grey one. I do think it could use a bit more detail work (belts, buttons, clasps etc.) and that the cloak could be a bit more articulated in the mesh. Maybe it could have a small cape on the back like the ebony cuirass. Also, the texture looks a bit too old and weathered for such a high-class piece of equipment. Otherwise, great work! Wow, that's one sweet cuirass! https://www.imperial-library.info/sites ... pic_02.jpg Nah, the belt finishes it. It doesn't need anything more than that. However, I do think the leather skirt-thing seen in the concept art should be attached to the cuirass, the way the Imperial Legion steel cuirass does it. Other than that, perfect. Ald-Ma' Cyrod, did you make any progress on that Prince armor set? Has the silver armor been added to data anywhere? If not, I'll claim that, it should a pretty simple matter of renaming Alaisiagae/Moranar's mesh resources and creating a plugin. I think TR added the missing silver pieces in the latest data update. The ones I linked are higher quality tbh - Moranar remodeled the arms and legs to be less lumpy, the ones in TR data have the diaper greaves like vanilla. At some point, we really need to figure out what we're doing when it comes to shared assets - it frustrates me that we can't get certain assets onto a level playing field as others because they're catering to the TR aesthetic, but I'm not about to have another argument with their people about graphics after the last showdown in Discord. Frankly, anything that's Cyrodiilic in origin we should have final call on, just like we wouldn't expect that bonemold or chitin armors be made to our specifications. At some point, I'd like to make the newtscale, studded leather, and chainmail variants not potato-quality either, we can do a lot just by improving the new meshes, we don't even need to touch any vanilla assets. I see your point, especially on the quality of the newtscale and studded leather stuff. Keep this stuff in mind, I'll see if we can't work something out. 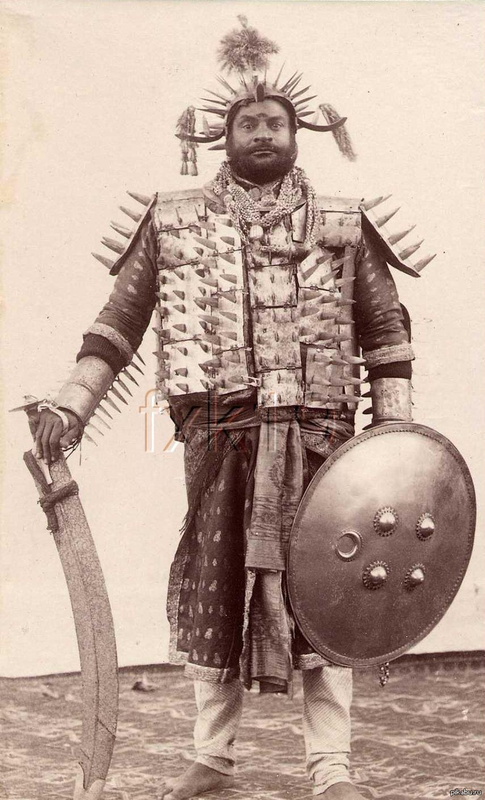 What about this indian ceremonial armor? It looks crazy and may be realized as nibenese spiked steel/bronze armor.